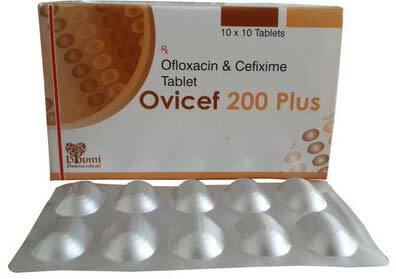 The Cefixime 200mg, Ofloxacin 200mg Tablets, we offer, are formulated using top of the line quality basic materials at our W.H.O. G.M.P. and ISO 9000: 2008 certified production facility. Quick response, precise composition and longer shelf life are the some of the features of these Tablets. Also, these Tablets are safe to consume as they have no side effects. Fair prices and timely deliveries are our forte.